Saudi Arabia has pledged to provide Yemen with 100% of its domestic fuel needs for the months of April and May as the country descends into chaos which threatens to spill over the Saudi border; but the $1.2 million petroleum package from the House of Saud is likely to be hijacked by Yemen’s battling elite as the struggle for patronage spirals out of control. 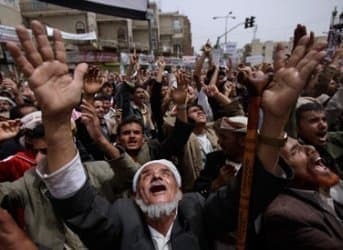 Yemen is perhaps Saudi Arabia’s greatest immediate concern as it has not been able to find a viable solution for containing a dangerous power vacuum in the wake of the deal that forced President Saleh to resign from power; and Saleh’s return, which remains a very real threat, would likely lead to an all-out civil war. The Saudi distraction in Yemen is so great at present that the kidnapping of a Saudi deputy consul in Yemen’s southern port city of Aden on 28 March was met with only a muted response from Riyadh. Yemeni police told reporters that the Saudi diplomat was taken from outside his home by unidentified gunmen and his whereabouts remains unknown. The kidnapping appears to be likely related to a “personal” conflict between the Saudi diplomat and influential forces in Aden, and not political in nature or directly related to one of Yemen’s various conflicts. While the search is on for the diplomat, Riyadh has more important matters to deal with in Yemen. Saudi Arabia is most immediately concerned about its own restive Shi’ite population in Jazan province, which borders the heart of Yemen’s Shi’ite Houthi rebel stronghold, Saada Province. The border crossings here are highly informal and include shared grazing rights, while human, weapons and other illicit trafficking activities flourish. Saada is now more stable that it was a year ago, but that is largely thanks to the fact that the Houthis have taken over the province entirely. In fact, they appointed a new provincial governor, Fares Man’a, who is a notorious international arms dealer once on President Saleh’s payroll until it was discovered that he was arming the Houthis. On a wider scale, the Saudis will intervene more aggressively if Yemen continues to descend into chaos amid a growing power vacuum. So far, that intervention has involved the purchasing of patronage from various Sunni tribes, particularly the increasingly powerful Sunni opposition party, al-Islah, which has engaged in numerous clashes with the Houthi in al-Jawf province, which abuts Saada province. When it became clear that President Saleh’s position was no longer viable, Saudi Arabia turned on the leader, brokering the deal that forced his resignation but leaving the Saleh-family security apparatus in place, along with parts of the military controlled by Saleh’s relatives. This was not simply a Saudi attempt to appease the protesting public by the creation of an illusion of power changing hands. It is much more complex than that. While some will argue that the move to force Saleh from power was purely cosmetic, it reflects Saudi policy with regard to Yemen, which has always been to maintain balance. Riyadh has attempted to maintain a modicum of stability in Yemen over the past decades by supporting certain elements of the government and also certain influential tribal elements that served as counterweights to the government. Today, there are far too many weights and counterweights, and Riyadh has lost control. The gift of petroleum products is but a very small bandage on a very large wound, intended to buy a very small amount of time while Riyadh lines up its pawns. Saudi Arabia will find little help from the US, which for all intents and purposes lacks a coherent Africa policy, and is particularly incapable of engaging successfully in complicated Yemen – its policy over the past years having been to flood Yemen with military aid earmarked for battling al-Qaeda-linked groups, ignoring the multitudinous problems facing Yemen – from the endless tribal rivalries and fluid allegiances, to Sunni-Shi’ite sectarianism, a Houthi rebellion in the north and a secessionist insurgency in the south, and how these conflicts intersect and are used as proxies. That military aid was used by Saleh both to fight al-Qaeda (in the form of al-Qaeda in the Arabian Peninsula, AQAP) and to prop up al-Qaeda in the battle against Houthi rebels in the north. Today, it appears as though Saleh is using AQAP to undermine the new regime. The only way (temporarily) out of the Yemen crisis is to find a replacement for Saleh (who has made it clear that he will not leave voluntarily). There is no viable figure because there are not enough state revenues from oil at present to buy enough patronage – a solution that, at any rate, would only lend false stability to the world’s poorest country. The Saudi’s are well aware that the current replacement, Abdu Rabu Mansur Hadi, Saleh’s former deputy, is not up to the task, though he will continue to be carted back and forth between Riyadh and Sana’a while the latter figures out its next move. In the meantime, if Washington hopes to be prepared for this next staging ground in the Saudi Arabia-Iran battle, it would be advised to reach out to someone who can devise a real Yemen (and wider Africa) policy that considers realities on the ground and complex regional and geopolitical dynamics and makes sense in the longer-term.